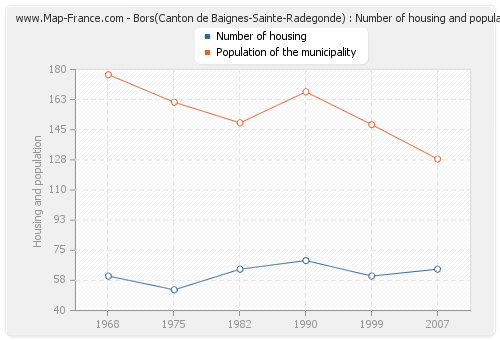 The number of housing of Bors(Canton de Baignes-Sainte-Radegonde) was estimated at 64 in 2007. These accommodation of Bors(Canton de Baignes-Sainte-Radegonde) consist of 51 main homes, 3 secondary residences and 10 vacant accommodation. Area of Bors(Canton de Baignes-Sainte-Radegonde) is 12,28 km² for a population density of 10,42 habs/km² and for a housing density of 5,21 housing/km². Here are below a set of graphic, curves and statistics of the housing of the town of Bors(Canton de Baignes-Sainte-Radegonde). Must see: the population data of Bors(Canton de Baignes-Sainte-Radegonde), the road map of Bors(Canton de Baignes-Sainte-Radegonde), the photos of Bors(Canton de Baignes-Sainte-Radegonde), the map of Bors(Canton de Baignes-Sainte-Radegonde). I like Bors(Canton de Baignes-Sainte-Radegonde) ! The number of housing of Bors(Canton de Baignes-Sainte-Radegonde) was 64 in 2007, 60 in 1999, 69 in 1990, 64 in 1982, 52 in 1975 and 60 in 1968. 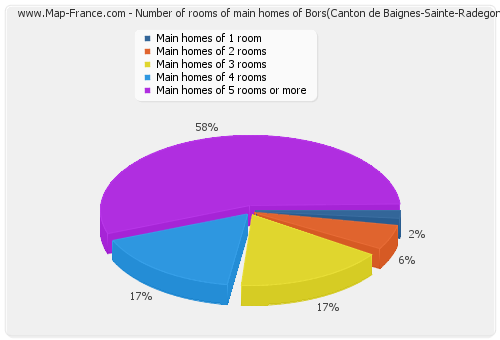 In 2007 the accommodations of Bors(Canton de Baignes-Sainte-Radegonde) consisted of 51 main homes, 3 second homes and 10 vacant accommodations. 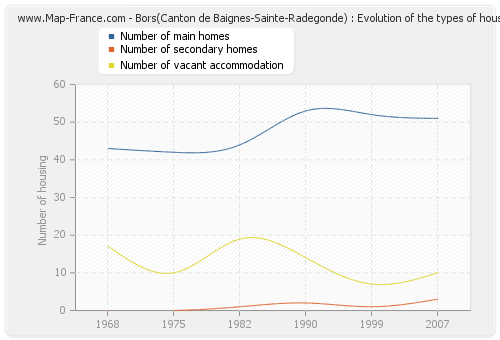 The following graphs show the history of the number and the type of housing of Bors(Canton de Baignes-Sainte-Radegonde) from 1968 to 2007. The second graph is drawn in cubic interpolation. This allows to obtain more exactly the number of accommodation of the town of Bors(Canton de Baignes-Sainte-Radegonde) years where no inventory was made. The population of Bors(Canton de Baignes-Sainte-Radegonde) was 128 inhabitants in 2007, 148 inhabitants in 1999, 167 inhabitants in 1990, 149 inhabitants in 1982, 161 inhabitants in 1975 and 177 inhabitants in 1968. Meanwhile, the number of housing of Bors(Canton de Baignes-Sainte-Radegonde) was 64 in 2007, 60 in 1999, 69 in 1990, 64 in 1982, 52 in 1975 and 60 in 1968. 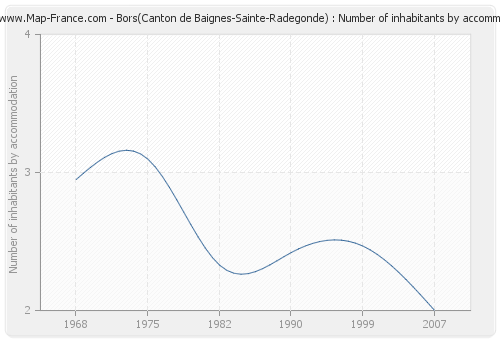 The number of inhabitants of Bors(Canton de Baignes-Sainte-Radegonde) per housing was 2,00 in 2007. The accommodation of Bors(Canton de Baignes-Sainte-Radegonde) in 2007 consisted of 64 houses. 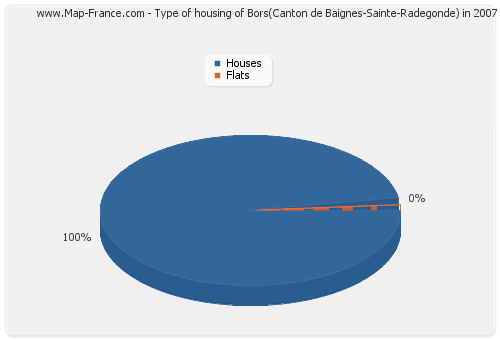 Here are below the graphs presenting the statistics of housing of Bors(Canton de Baignes-Sainte-Radegonde). 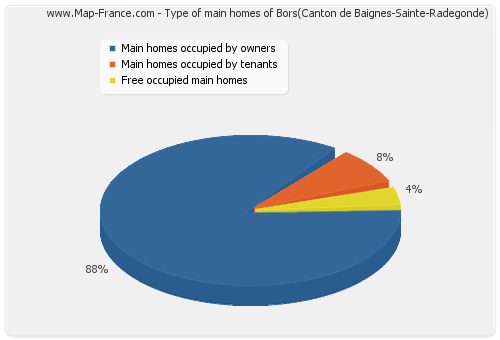 In 2007, 45 main homes of Bors(Canton de Baignes-Sainte-Radegonde) were occupied by owners. 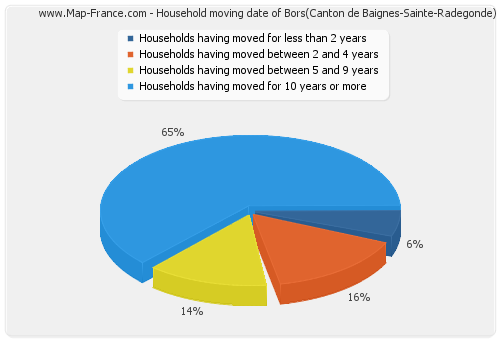 Meanwhile, 51 households lived in the town of Bors(Canton de Baignes-Sainte-Radegonde). 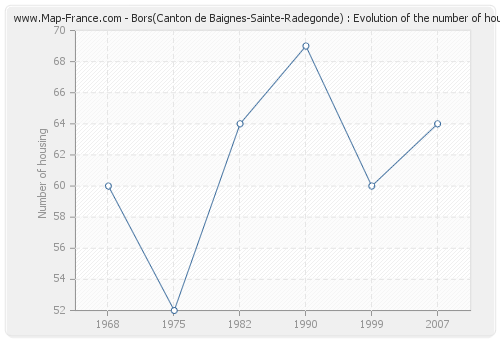 The following graphs present the statistics of these households of Bors(Canton de Baignes-Sainte-Radegonde).